Unfortunately George A. Romero did not show due to health issues. 2017 has been a year of conventions for me and sometimes they just feel like a sweet release from the real world for a day or a weekend or however long. I am a big fan of conventions and I tend to go to at least one a year, possibly two. Last year it was Wizard World St. Louis and HorrorHound Indy. Wizard World has become a shell of its former greatness and HorrorHound was a new experience for me. For some reason 2017 became the year of the convention for me and it is not over. I have now been to four and one of these I was a guest for my comic. The first was Wizard World St. Louis and it was, ok. We walked around and bought some prints and my kiddos had a ball going from cosplayer to cosplayer taking pictures. Star Wars Celebration Orlando 2017 was just two weeks after Wizard World and much of the same, bought some things and took a ton of pictures. Mighty Con St. Louis was a few weeks ago and I was selling my comic and meeting all kinds of comic book contacts. So, that leads me to Days of the Dead Indianapolis 2017. This is my second horror convention overall and forth in 2017 and not the last, I should add. Days of the Dead puts on a good show, that is one thing I can tell you. If you’re a fan and wanted to try a convention, this may be the one. Sure I said the same thing about HorrorHound. 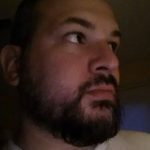 The biggest difference between the two that I can tell…HorrorHound seems to have more vendors, posters, tshirts and other things, also HorrorHound has Mask Fest in Indy. Days of the Dead had some vendors, not as many vendors, but the guest list was packed with stars of horror. HorrorHound’s list this year and last, kind of blah. Days of the Dead Indy planned on having a Dawn of the Dead reunion with the cast and director George A. Romero. Romero had to drop due to health issues, so Linda Blair took his slot. But then, Bill Moseley, Sid Haig, John Dugan, some wrestlers to name a few. But, if you’re a fan of Friday the 13th, Kane Hodder who played Jason in Fridays 7 and 8, Jason Goes to Hell and Jason X. C.J. Graham, Jason from Jason Lives along with Steve Dash from Friday the 13th part II. They also had Shelly, Larry Zerner from Friday the 13th 3D, the man who got Jason his mask and the first Friday final girl, Alice herself, Adrienne King. I mean, this is a great line-up of celebrity guests. I had the opportunity to meet these five guests and for me it was a sort of dream come true. C.J, Graham is my favorite version of Jason, Kane Hodder is the man who played him the most, Steve Dash is the first adult Jason, Larry Zerner gave Jason the mask and Adrienne King gave Jason the reason to kill. I want to share a couple of things from each guest. Larry Zerner: I let him know that I was a fan of Shelly’s. I told him, in certain circles Shelly gets a bad rap, but I didn’t mind him and for the most part understood the character. He told me, it is an 80/20% split, he thinks 80% like Shelly and 20% do not. Well, I really don’t know, but over the years I’ve grown to like the character and I think he was very important to the film. Adrienne King: What an amazing woman to talk to, she gave me every single minute I wanted to visit with her. She asked me what I wanted to her to sign, I said my favorite line in the film and she did. Then I told her the story of my mother seeing Friday the 13th right after I was born in the theater. She wanted to see Friday the 13th so bad, she took me, at possibly 10 days old or less and sat in the back. She watched Friday the 13th with me as a baby, she did say I slept the entire time. Adrienne loved this story and thinks I may have been the youngest to see the movie at the time. Adrienne King was super sweet and super small. I really enjoyed meeting her, she gave Reynolds, my son a hug and I got one too. It was a great experience. My son and I had a photo op with C.J. 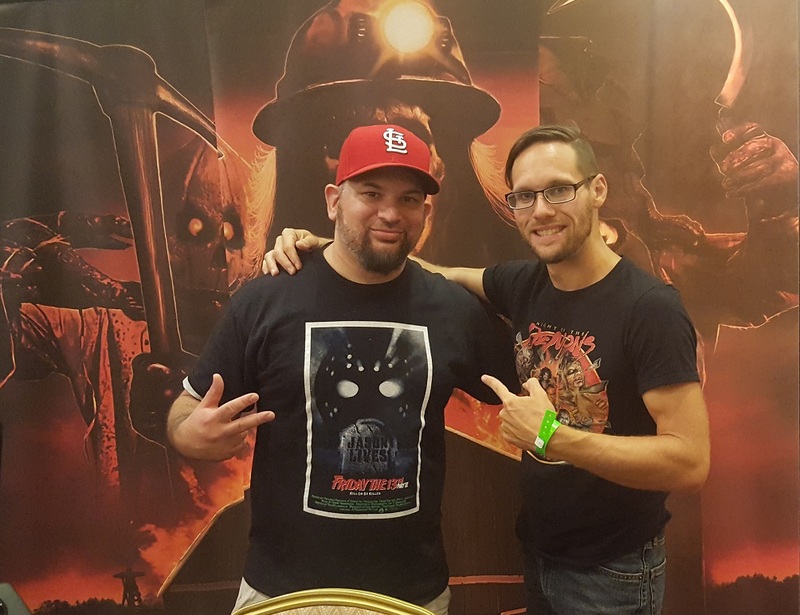 Graham from Jason Lives and Steve Dash who played Jason in Friday the 13th part II. 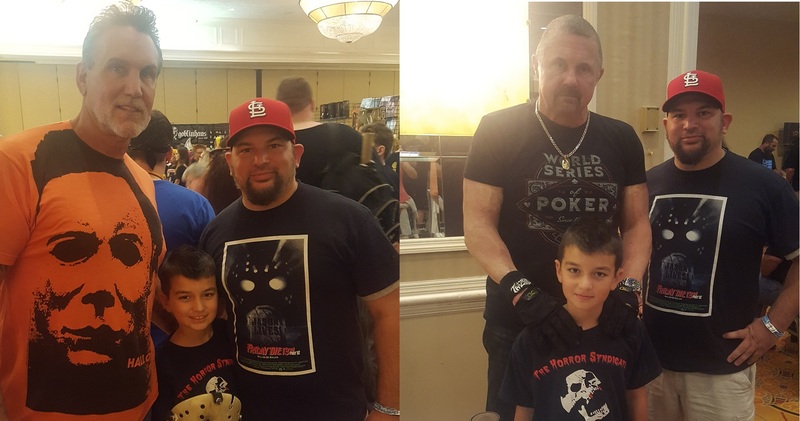 After the photo opp we walked around and finally saw Kane Hodder. Kane was sitting at a table in the corner near Linda Blair. Luckily more people were in her line at that moment. I went on over and opened my book, Crystal Lake Memories and had him sign. While waiting in line, he and the women at his table were singing the theme from the Golden Girls. He did ask Reynolds about his favorite Jason and Reynolds answered “part 7”. Kane was pretty happy with that answer. He was a very pleasant guy, posed for a picture with my son and I, but also posed with my brother in-law and his daughter. C.J. Graham: He was amazing, we sat there and watched him talk with every fan that came to the table. When it was our turn, he looked at Reynolds and gave him a fist bump. Reynolds told C.J., he wanted to play Jason one day and C.J. asked if he was 12, Reynolds is 8. He told Reynolds that he expects him to be Jason in 12 years. He then, without effort lifted Reynolds up on a chair and took a picture with him. Then of course came over and took one with the two of us. He was happy to see Reynolds holding the mask from part 6, which is a custom paint job from my friend Frankie Carter. Then he turned his attention to fan relations, asking how we liked the show and if the photo op was worth it. He is very concerned about the fan experience and man that is refreshing. One last note, Dee Snider was walking by me while I was having lunch, I was eating nachos. He looked at me and pointed down to my plate of nachos and said, “NACHOS!” and kept walking. I went to different booths buying custom horror prints by few different artist. They can be viewed in the video below. Jack Chattox, Vile Consumption and Terence Muncy of Black Forest Studios are the names of the artists I found and loved their work. All three were great at what they do and super friendly. I love getting nearly one of a kind prints from these conventions. There truly some great artists with an eye for something different, at least check them out when you go to a convention. Vile Consumption is creating classic comic covers with horror monsters, Freddy Krueger, Jason Voorhees, Pinhead and others, check the video below to see what I am talking about. I ran into Justin Seaman, writer/director of the Barn. I saw the booth early in the day, but I did not see Justin. So I came back as I was leaving and had a nice conversation with Justin. We talked about other cons, new projects and possibly having him on The Horror Syndicate Live some time soon. He is a busy man and you can see him at New Jersey Horror Con in September. In the video above you can see all the goodies I got from the Barn booth. Check out Jared’s review on the Barn if you get the chance. The booth next to the Barn was for a film I am excited to see and had the chance to buy the Blu Ray, Night of Something Strange. The movie is pretty gory and kids should not see the film, according to the cast. Wayne W. Johnson, he plays the villain or monster, I don’t know yet, was a very engaging person. He was all about signing my copy, hooking up on social media and getting a picture together. Super friendly dude, he wanted to grab the lead of the movie, Trey Harrison so I could get a group shot of a couple of cast members and director Jonathan Straiton. Great guys I was glad to meet at the con and I can’t wait to watch the movie tonight, then review. All three signed my Blu Ray and poster. 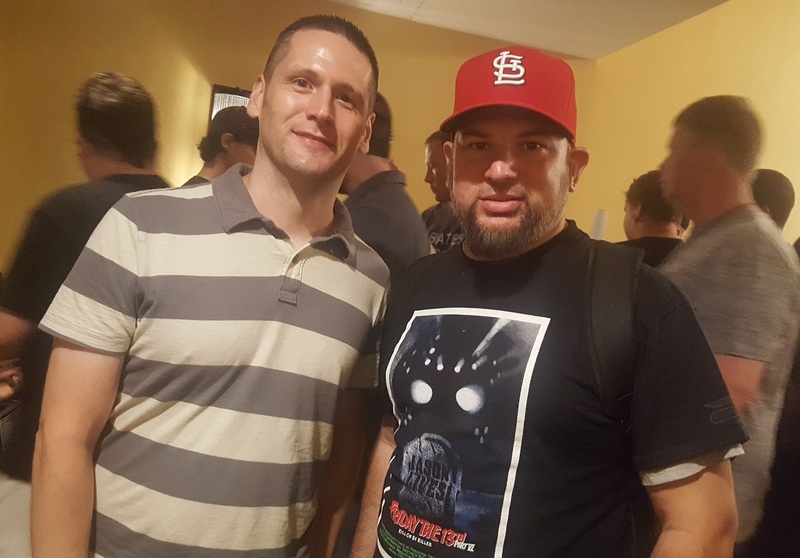 I also ran into a friend of the website, independent horror film maker, Troy Escamilla. It was great meeting him in person, we got to chat about his first feature, Party Night. We also discussed his next film Stirring, which just wrapped shooting. I tried fishing for some juicy spoilers, he did tell me Stirring may be better than Party Night and using different cameras gives it more of a cinematic look. There was one scene he did tell me about as they upped the gore, but I am keeping that to myself. Check out Jared’s review of Party Night. Overall Days of the Dead was an awesome time. 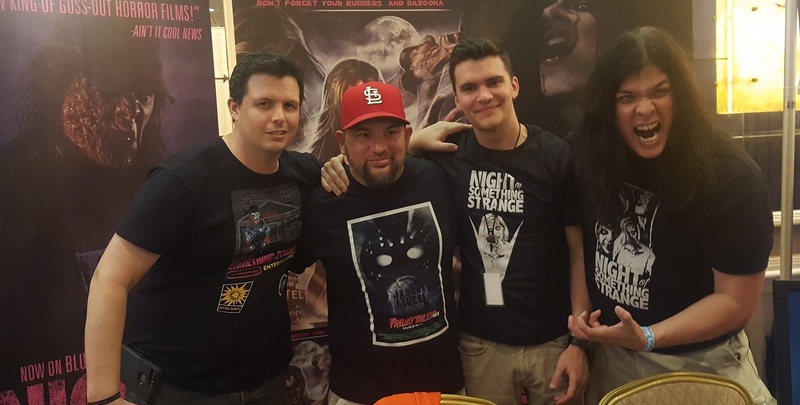 Being surrounded by other horror fans and a world of art, actors and collectibles is almost like being at home. I loved my time and had a bad hang over after, wishing I was there all the time, but the ole pocketbook wouldn’t like that. I came home with so many memories, met some great creators and people in general. I will never forget my time at Days of the Dead. If I have to rank the two horror conventions I have been two, Days of the Dead was more for me than HorrorHound. But HorrorHound gets a second chance in September. Next up for me, Flashback Weekend Chicago. I am trying to get my friend Jared of the Horror Syndicate to come out with me to one of the two, Morgan may end up going to HorrorHound to meet more people from Bates Motel. Flashback Weekend will have a massive A Nightmare on Elm Street presence, Robert Englund, Heather Langenkamp, Amanda Wyss, Lisa Wilcox and more. I could get another Jason to sign, Ken Kirzinger. HorrorHound will have pretty much everyone from Friday the 13th part 2, including Steve Dash and Amy Steel. Days of the Dead has other shows coming up soon too, but I need to try these other two first. Come find me, you could end up in an article!